Has received support for this research from the Spanish Ministry of Education and Science (SEJ200767661/PSI). In this paper a self-report questionnaire on reading-writing difficulties for adults in Spanish (ATLAS) is presented. Studies that use self-report questionnaires as a tool for screening of reading-writing difficulties in adults were reviewed. Two studies were carried out to determine the validity and reliability of ATLAS. The first study was aimed to select the critical items and to assess their reliability and their ability to discriminate. In the second study the assessment reported through the answers to the questionnaire was contrasted with the results of psychometric tests. Results showed that (a) items were suitable descriptors for adult difficulties, (b) there were significant correlations between self-report scores and reading measures, and (c) the items discriminate between good and poor readers. The results of this study demonstrated that ATLAS is a sensitive tool to screen adults with reading difficulties. As a further advantage, ATLAS is an easy-to-use and time-saving instrument. Key words: Dyslexia; reading-writing difficulties; adults; self-report questionnaires. En este trabajo se presenta un cuestionario de autoinforme de trastornos lectores para adultos en español (ATLAS). Se comienza por revisar las investigaciones que demuestran la utilidad y la fiabilidad de los auto-informes como instrumento para valorar las habilidades lectoescritoras de los adultos. A continuación se describe un estudio destinado a seleccionar los ítems críticos en función de su capacidad discriminativa. Este estudio permitió la elaboración de la versión final del autoinforme. Finalmente, en un segundo estudio se contrastan los datos recogidos a través del auto-informe con los obtenidos mediante pruebas psicométricas en una población universitaria. Los resultados indican que los ítems permiten (a) describir las principales dificultades de lectoescritura y (b) discriminar entre normolectores y estudiantes con dificultades. Por otra, (c) los resultados muestran que la autovaloración realizada mediante el autoinforme coincide con las medidas obtenidas mediante pruebas objetivas. Estos resultados apoyan la utilidad y fiabilidad del uso del ATLAS para detectar adultos con trastornos de lectoescritura. Presenta, además, la ventaja de ser fácil y rápido de usar. Palabras clave: Dislexia; dificultades de lectoescritura; adultos; autoinformes. Several researches have employed self-reports to recall information about personal history of learning to read or current reading and spelling abilities from adults. The advantage of self-reports is that they gather multiple and reliable information in a short time, even without personal contact with the examined individual. This last quality is of great value due to the unwillingness of adults to participate in tasks of evaluation (Gilger, Pennington & DeFries, 1991; Schulte-Körne, Deimel & Remschmidt, 1997). The present paper is aimed to present and describe the elaboration of ATLAS a self-report questionnaire of reading abilities for adults in Spanish (Autoinforme de Trastornos Lectores para AdultoS). Recent findings have provided evidence that make it especially relevant to have reliable instruments to gather information about reading abilities in adults. First, it has been observed that the deficits that affected the acquisition of literacy persist despite of age and instruction (Bruck, 1992; Davis et al, 2001; Elbro, Nielsen & Petersen, 1994; Felton, Taylor & Wood, 1995; Hatcher, Snowling & Gnfiths, 2002; Jiménez, Gregg, & Díaz, 2004; McLoughlin, Leather & Stringer, 2002; Shaywitz, Morris & Shaywitz, 2008; Vukovic, Wilson & Nash, 2004). A second finding is that the parents of children diagnosed of dyslexia recognize in themselves the same disabilities shown by their children (Lefly & Pennington, 2000; Pennala, Eklund, Hämäläinen, Richardson & Martin, 2010; Remschmidt, Hennighausen, Schulte-Körne, Deimel & Warnke, 1999; Scerri & Schulte-Körne, 2010). In sum, there is a body of research suggesting the benefits of having available tools to detect adults with learning difficulties. This information will allow establishing strategies for prevention and support (Callens, Tops & Brysbaert, 2012). Several studies have proven self-report questionnaires to be reliable procedures. For example, Gilger (1992) assessed the reading abilities of 1118 children and adults and compared the results with their answers to an interview and a questionnaire. Reported difficulties were highly correlated with the diagnostic measures. In the study by Schulte-Körne et al. (1997), the percentage of coincidence was up to 88% between self-report responses and the psychometric measures of 79 adults. Two years later, the same team found a coincidence of 87% in the distribution obtained from the participants' scores to a self-report questionnaire and several behavioral measures (Remschmid tet al., 1999). The study of validation of the Adults Reading History Questionnaire: ARHQ carried out by Lefly & Pennington (2000) confirmed again that adults provide accurate and valid information about their difficulties highlj coincident with diagnostic measures. Decker, Vogler & Defries (1989) concluded that self-reports are valid instruments to determine the "reading status" since parents who informed of reading difficulties obtained lower scores in the reading tasks. Furthermore, Wolff & Lundberg (2003) found self-reports more powerful discriminators than phonological or orthographic tasks. In a recent study, Deacon, Cook & Parrila, (2012) compared the performance of 20 university students previously diagnosed as dyslexic, with 31 university students identified by their answers to questionnaire, and 33 control students. Both self-reported and previously diagnosed groups had a lower performance on accuracy and speed measures than the control group. These results led the authors to consider self-reports as valid tools to recruit students with reading difficulties, although they could be less accurate in the case of students with late emerging difficulties. A second group of studies have used self-reports to quantify the degree of familial risk for reading disabilities. It is a common assumption that reading deficits tend to run in families, and the risk of a child being dyslexic is higher if she/he has affected relatives (Flax, Realpe-Bonilla, Roesler, Choudhury & Benasich, 2009; Shaywitz et al., 2008). Several studies provided evidence that compared to their controls, children with a history of familial risk are more likely to develop reading disabilities (Snowling, Gallagher & Frith, 2003; Wolff & Melengailis, 1994), language acquisition disorders (Sptiz, Tallal, Flax & Benasich, 1997; Tallal, Ross & Curtiss, 1989), spelling difficulties (Schulte-Körne, Deimel, Müller, Gutenbrunner & Remschmidt, 1996) or poor phonemic recognition (Pennala et al., 2010; Richardson et al., 2003). Altogether, these results showed that children whose parents reported reading difficulties scored worse than their controls in reading tasks (Decker, Vogler & DeFries, 1989; Gilger, 1992; Lefly & Pennington, 2000). Self-report questionnaires have been frequently included as a means of gathering data for sample selection and participants distribution into groups (Bekebrede, Van der Leij, Plakas, Shareb & Morfidi, 2010; Birch & Chase, 2004; Corkett & Parrila, 2008; Hatcher et al., 2002; Ramus et al., 2003; Scarborough, 1991; and the productive Finish team Torppa, Eklund, Van Bergen, & Lyytinen, 2011). The results of the studies described up to here reveal that self-report questionnaires gather multiple and reliable information, are not time-consuming, and allow to identify individuals with (or with risk of) reading disabilities. Thus, the findings reported above demonstrated to be worthwhile the design and use of a self-report questionnaire of reading difficulties for Spanish speakers. The aim of the first study was to select self-report items. A review of the commented papers and the questionnaires they used (Lefly & Pennington, 2000; McLoughlin et al., 2002; Parrila, Corkett, Kirby & Hein, 2003; Vinegrad, 1994) showed that the profile of a person with reading disabilities is made up of three types of data: a) the history of learning to read and school years; b) parents' and close relatives' reading history, and c) current difficulties. As can be observed, the last set of data differs from the others. While schooling and family records concern provable data, assertions about reading performance require subjective evaluation. Furthermore, these items are critical to identify individuals with a profile of reading disabilities and to distinguish normal from deviant readers. Consequently, it was interesting to make sure that these items (hence, critical items) describe difficulties dyslexic individuals recognize in themselves, but are not shared, or at least not to the same extend, by normal readers. Following this logic we intended to test to what extend critical items differentiate individuals with a profile of reading difficulties among a sample of University students. A total of 994 students (640 women, 354 men) from the first course of the 46 degrees offered at the University of Malaga (Spain) answered a questionnaire. Mean age was 19.9 (S.D. : 4.375). A list of 31 statements was elaborated. 13 items referred to reading-writing difficulties, 18 to difficulties not directly related to literacy, however referred as common characteristics of individuals with dyslexia (Lefly & Pennington, 2000). Statements were written as affirmative assertions. Participants were required to answer if they believe the item described their present difficulties marking Yes or No. Participants completed the questionnaires in the class-rooms where they usually attended lectures. The examiner gave instructions and stayed in the classroom until the students completed the form. The time needed to complete it was less than 10 minutes. This study intended to analyze the strength of critical items to distinguish between normal and deviant adult readers. Following this goal, percentages of Yes answers to the critical items were calculated. It was expected that high discriminant items would be selected by a reduced number of participants. The logic behind this assertion is that if many students consider they have a particular difficulty, it would not distinguish between good and poor readers. Thus the item would not be relevant for our purposes. 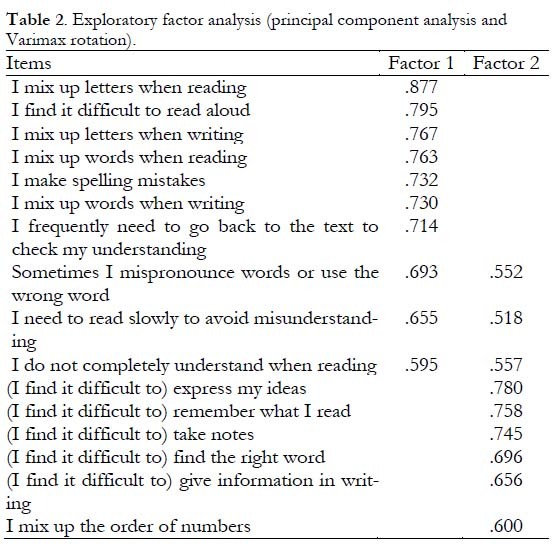 As can be observed in Table 1, compared to the total sample the items directly associated with reading difficulties were chosen by a low percentage of students (I mix up the order of numbers: 1.8%; I mix up words when writing: 3%; I mix up letters when reading: 3.7%; I mix up words when reading: 7.8%, and I mix up letters when writing 6.1%). A higher percentage of students, although lower than 20%, reported having difficulties for text comprehension and misspellings (I need to read slowly to avoid misunderstanding 18.6%; I make a lot of spelling mistakes: 10.3%; I do not completely understand when reading 11.5%; I find it difficult to read aloud: 13.4%). More interesting is the fact that the answer tendency reversed when students with and without previous diagnosis or present difficulties were compared. A fact that pointed to participants being reliable respondents (Snowling Dawes, Nash, & Hulme, 2012). A Chi-square analysis was carried out to explore whether the participants with and without a previous diagnosis (P.D. ), and with or without difficulties at present (C.D.) differed in terms of the items chosen to describe themselves. 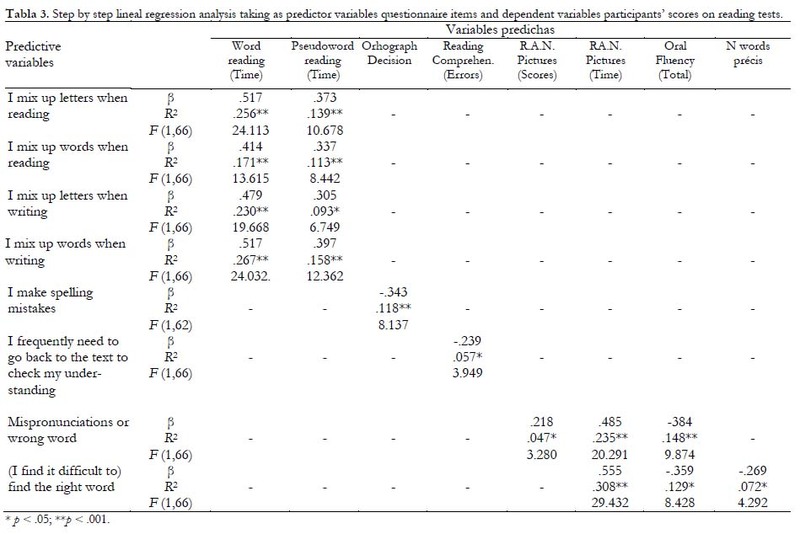 As it is shown in Table 1, seven of the critical items discriminated between participants with and without previous diagnosis: I mix up letters when reading (Chi2= 25.090, p < .001); I mix up words when reading (Chi2=13.310, p< .001); I mix up letters when writing (Chi2= 26.758, p< .001); I mix up words when writing (Chi2=8.410, p< .001); I make a lot of spelling mistakes (Chi2= 8.132, p< .001); I need to constantly check my spelling (Chi2= 12.044, p< .001); (I find it difficult to) take notes (Chi2= 6.05, p< .05); as well as between those who declared or declared not having difficulties at present (D.A. ): I mix up letters when reading (Chi2= 25.34, p < .001); I mix up words when reading (Chi2=28,92, p< .001); I mix up letters when writing (Chi2= 34.83, p< .001); I mix up words when writing (Chi2=26.57, p< .001); I make a lot of spelling mistakes (Chi2= 31,52, p< .001); I need to constantly check my spelling (Chi2= 44.54, p< .001); (I find it difficult to) take notes (Chi2= 20.62, p< .05). Participants with and without PD differed in their answer to the item I mix up the order of numbers (Chi2= 4.50, p< .05). The group of student that declared having current difficulties chose (I find it difficult to) give information in writing (Chi2= 4.86, p< .05) more frequently than the ones who considered themselves as normal readers. Regarding the associated difficulties, only one item (I find it difficult to) take notes distinguished P.D. (Chi2= 6.05, p< .05), and C.D. students (Chi2= 20.62, p< .05). In this study, items were selected to distinguish normal from poor readers. It was assumed that the discrimination power of items decreases if they are chosen by a large number of students. Consequently, after counting responses, it was decided to exclude items chosen by more than 20% of the students. An exception to the former criterion was made with four items. Three of them referred to the use of oral language: Sometimes I find it difficult to find the right word, Sometimes I mis-pronounce words or use the wrong word, and (I find it difficult to) express my ideas. The exclusion of these items would have ruled out the exploration of the subject's judgment about his/her oral abilities that had proved to be closely related to reading performance (Scarborough, 1991; Snowling et. al., 2003). I frequently need to go back to the text to check my understanding was also maintained. In this case the reason was that it seemed reasonable to include at least three items referred to reading comprehension. Furthermore, this item, although frequently chosen, has shown different percentages in the groups reporting or not current difficulties. Finally, only one item about spelling mistakes was left. The final version of the questionnaire included 12 items concerning specific difficulties, and 9 concerning associated difficulties. Cronbach's alpha (α) was calculated to assess the reliability of the selected 21 items. The coefficient value was .711, a satisfactory level of reliability. Consequently, it is expected that the critical items will be accurate to provide the profile of adults with reading difficulties. The first study aimed to select items sensitive enough to capture subjects' judgments. The following study was intended to explore if the answers given to the questionnaire were consistent with psychometric tests data. The aim of this study was to explore whether the self-assessment made through the items of the questionnaire could predict outcomes in a variety of reading and phonological tasks. In other words, to test weather participants were reliable respondents when required to describe their own difficulties. As mentioned above, previous research has repeatedly documented that adults' reports about their difficulties are highly consistent with measures obtained by means of psychometric tests (Deacon, et al., 2012; Lefly & Pennington, 2000; Snowling, et al. 2012; Wolff & Lundberg, 2003). However, a few studies had failed to find these relationships (Elbro, Borstrom & Petersen, 1998; Hindson, Byrne, Field-ing-Barnsley, Newman, Hine, & Shankweiler, 2005). Still, some authors attributed correlations to different factors as family education and expectations (Scarborough, 1991). Given this context, the second study was designed to answer three questions. The first two concerned the self-report questionnaire validity. Thus, it was intended to determine whether the items allow gathering information about reading difficulties, and to what extend they are able to discriminate between good and poor readers. The third caveat was focused on evaluating weather adults are able to reliably describe their difficulties. This last goal required contrasting questionnaire responses with the participants' performance on a set of psychometric tests. If, as expected, participants' outcomes were consistent with their self- descriptions, it could be assumed that the questionnaire is a reliable tool for screening adults with reading difficulties. Participation in this study was offered as a way of getting extra-course credits to undergraduates in their 4th year at the Faculty of Psychology of the University of Malaga (Spain). 55 participants (45 women, 10 men) mean age 23.47, (S.D. : 3.7) were recruited by this procedure. Ads were also placed on the Andalusian Association of Dyslexia (ASANDIS) website and on University screens. 12 university students with a previous diagnosis of dyslexia (8 women, 4 men) age ranged from 20 to 49 (mean age 29.7; S.D. : 9.58) were recruited by this procedure. Participants were previously interviewed to make sure they did not have any sensory, neurological, or other cognitive disorder. After the analysis and selection of the critical items, a 50 items self-report questionnaire was designed. Items were organized in 7 sections as it is described in the following section. (A complete version of the questionnaire is presented in the Appendix). Section 1. Schooling and learning to read (6 items). The items gather information about school years and the learning to read experience. Section 2. History of learning difficulties (6 items). Specific information about past learning difficulties and if the subject has received support for his/her difficulties. Section 3. Current difficulties (12 items). The selected critical items are included in this section. Section 4. Associated difficulties (9 items). It includes the previously selected secondary difficulties associated to dyslexic adults. Section 5. Family history (2 items). It has been repeatedly observed that having relatives with reading difficulties is associated with a higher risk of showing the same symptoms. Thus, 2 items question whether other relatives show learning difficulties. Section 6. Work experience (6 items). The questionnaire had been initially conceived to be used with university students. Nevertheless, it is common that students who report reading difficulties have begun studying again after dropping out of their studies and trying a job (McLoughlin et al., 2002; Taylor & Walter, 2003). Furthermore, dyslexic adults frequently declare having jobs under their abilities and several changes of work place (McNulty, 2003). Consequently, it was interesting to question about work experience, since it also widened the possibilities of application. Section 7. Reading habits (9 items). Finally, it was interesting to know if the participant reads frequently and if he/she practices activities that require the use of written information. Sections 1, 2, 5, 6, and 7 were written as questions. For the critical and associated items the format of affirmative assertions was preferred. For most items, participants were asked to indicate the degree of difficulty he or she had with a particular aspect by a 5 points Lickert scale (0 (never) to 4 (very frequently)). When it was not possible to use this format, questions were designed in a force choice format to avoid subjective answers. A battery of phonological, comprehension and writing tests to each individual was administered. Standard tests were used, except for the numbers naming task, and orthographic decision task that were constructed for the present study. The reading and phonological tasks were taken from the Batería para el Diagnóstico de la Dislexia en Español DIS-ESP (Carrillo, Alegría, & Luque, in preparation). It was discarded by interview that participants presented any neurological, sensorial or motor disorders. Intelligence was assessed by the Raven test. To evaluate the presence of other language disorders participants completed the subtest of syntactic comprehension of EPLA (the Spanish adaptation of PALPA by Valle & Cuetos, 1995). To determine the presence of attentional deficit participants fulfil the Scale of Attention BAAD (Brown, 1996). 2.1. Subtests of Word and pseudoword reading (DIS-ESP). Subjects were asked to read 3 lists of words and 3 of pseudowords as quickly as possible. Reading time and accuracy were recorded. 2.2. Orthographic decision. Two lists of 37 low frequent words each and their corresponding pseudohomophone were elaborated. To construct pseudohomophones inconsistent graphemes were substituted for phonologically equivalent graphemes (v/b; g/j; h/-). Subjects were asked to mark the correct spelling. Decision time and accuracy was recorded. 2.3. Test of written test comprehension. The Test of comprehension processes (Vidal Abarca, 2007) was chosen because it was designed to reduce memory interferences, it is ease to apply and correct, and it is low time consuming. The text includes a training text plus two tests for evaluation. After reading each text, subjects are required to answer 10 questions by selecting one out of four alternative responses. Time and number of correct answers were recorded. 3.1. Subtest of Phoneme deletion (DIS-ESP). Subjects were instructed to delete one phoneme from 31 CVC, CCVC, and CVC nonsense monosyllabic compounds. 3.2. Subtest of syllable deletion (DIS-ESP). Subjects were instructed to delete one syllable from 24 three-syllabic pseudowords. In both tests after hearing the stimulus via loud-speakers, subjects had to repeat the stimulus and then pronounce the resulting compound. Number of correct answers was recorded. 3.3.1. Subtest of Rapid automatic Naming: Pictures (DIS-ESP). Subjects were asked to name pictures presented in four blocks of 18 pictures each as fast as possible. Every block and total naming time was taken. 3.3.2. Rapid automatic Naming: Numbers. Subjects were asked to name a series of 100 numbers as fast as possible. Naming time and accuracy were recorded. 3.4. Subtest of oral fluency (DIS-ESP). Subjects had 30 seconds to say as many words as possible following a phonological or semantic prompt. Number of words was recorded. Participants also responded to an oral comprehension task, and two tests of phonological memory. However, as no significant results were found, description and data were not included in the present paper. Participants were evaluated individually in two sessions of approximately 1hour 30 minutes each. As the purpose of this study was to test the validity of the questionnaire to gather data about reading abilities, data analysis was focused on the critical and associated items. The results regarding the three questions will be presented separately. Do items allow gathering information about reading difficulties? An exploratory factor analysis (principal component analysis and Varimax rotation) was carried out to identify factors. Results are shown in Table 2. The factor analysis identified two factors. Factor 1 (38.54% of variance) had significant loadings for critical items connected to reading mechanisms: I mix up letters when reading (.877); I find it difficult to read aloud (.795); I mix up letters when writing (.767); I mix up words when reading (.763); I make spelling mistakes (.732); I mix up words when writing (.730); slightly less loadings to items referred to reading comprehension: I frequently need to go back to the text to check my understanding (.714); I need to read slowly to avoid misunderstanding (.655); I do not completely understand when reading (.595). This factor also included an item on word use and access Sometimes I make mispronunciations or use the wrong word (.693). Items with significant loadings in Factor 2 (30.12%. of variance) were related to the use of verbal information to comprehend and express ideas: (I find it difficult to) express my ideas(.780); (I find it difficult to) remember what I read (.758); (I find it difficult to) take notes(.745); (I find it difficult to) find the right word (.696); (I find it difficult to) give information in writing (.649); I mix up the order of numbers (.600); I do not completely understand when reading (.557); Sometimes I make mispronunciations or use the wrong word(.552); I need to read slowly to avoid misunderstand- ing(.518). Both factors taken together explain 68.066% of variance. Cronbach's alpha yielded a reliability coefficient of .951, indicating a very good level of internal consistency. The pattern of results is coherent with recent models of reading abilities that point to two types of variables affecting reading competence (Hulme & Snowling, 2009). On the one side, there are decoding processes as phoneme awareness and word reading mechanisms (Factor 1). On the other, comprehension and use of language processes are considered (Factor 2). Consequently, the questionnaire seems to offer a reliable tool for adults to inform about their reading competence. Do critical and associated items discriminate poor and normal readers? The study was also intended to find out if ATLAS is a reliable instrument to rapidly screen poor from normal readers. It was first observed that normal readers chose lower scorings than previously diagnosed participants. This pattern was in agreement with our expectation that poor readers would consider items better descriptions of their competence than normal readers. To assess whether previously diagnosed students differed from normal readers in their description through the items of the questionnaire a one-factor analysis of variance (ANOVA) was carried out. 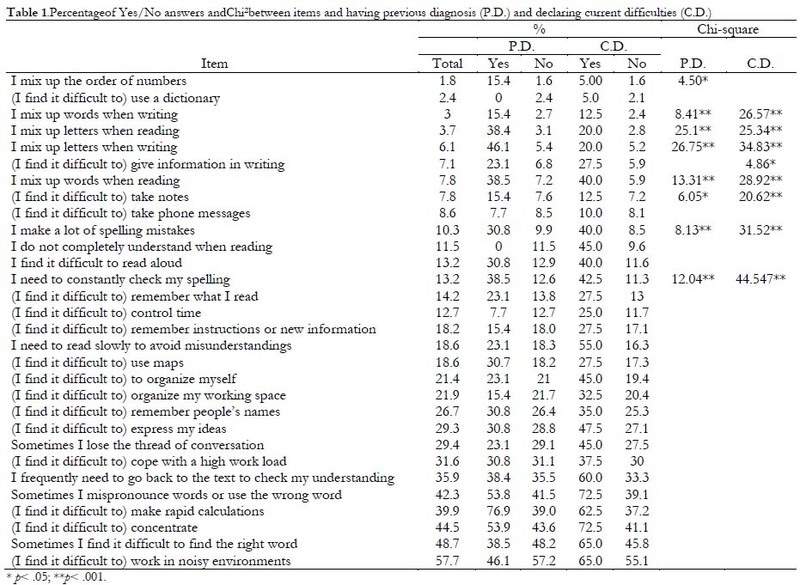 Principal effects by type of reader were found for 18 out of the 21 items. I mix up letters when reading [(F (1,66) = 19.968, p<; .001]; I mix up words when reading [(F (1,66) = 7.002, p<; .001]; I do not completely understand when reading [(F (1,66) = 9.048, p<.001]; I need to read slowly to avoid misunderstanding [(F (1,66) = 29.945, p<; .001]; I frequently need to go back to the text to check my understanding [(F (1,66) = 17.782, p<; .001]; I mix up letters when writing [(F (1,66) = 15.962, p<; .001]; I mix up words when writing [(F (1,66) = 16.059, p<; .001];I make spelling mistakes [(F (1,66) = 12.102, p<; .001]; I mix up the order of numbers (F (1,66) = 5.081, p<; .001]; I find it difficult to read aloud [(F (1,66) = 26.761, p<; .001]; Sometimes I make mispronunciations or use the wrong word [(F (1,66) = 15.275, p<; .001]; (I find it difficult to) find the right word [(F (1,66) = 15.240, p<; .001]; (I find it difficult to) remember what I read [(F (1,66) = 4.979, p<; .05]; (Ifind it difficult to) give information in writing [(F (1,66) = 10.508, p<; .001]; (I find it difficult to) express my ideas [(F (1,66) = 8.907,p<; .001]; (I find it difficult to) take phone messages [(F (1,66) = 6.747, p<; .001]; (I find it difficult to) remember instructions or new information [(F (1,66) = 8.213, p<; .001]; (I find it difficult to) use a dictionary [(F (1,66) = 5.771, p<; .001]. However, the indirectly associated items (I find it difficult to) control time or (I find it difficult to) use maps, (I find it difficult to) take notes yielded no differences between groups. One plausible explanation is that taking notes is a complex activity, consequently all students could have considered it difficult whatever their ability to read and to write. The observation that poorer readers had higher self-report scores than the better readers, along with the difference in the response distributions between both groups confirmed our expectation that adults are reliable at describing their difficulties. Therefore, the critical and associated items of ATLAS could be valid to screen adults with reading difficulties. Are self-report responses good predictors of performance on psychometric tests? Relation to behavioral measures. The concordance between objective measures and subjective self-report data would provide the strongest support for the questionnaire as a predictive instrument of reading performance. Hence, previous research has found that adults who self-reported reading problems scored significantly worse on reading tests (Lefly & Pennington, 2000; Deacon et al., 2012). To examine whether the questionnaire items were able to predict psychometric scores a lineal regression step by step analysis was performed. Results are shown in Table 3. Word reading time was predicted by the items concerned with reading and writing letters and words. I mix up letters when reading (F (1,66)= 24.113, p=.001, R2= .256). I mix up words when reading (F (1,66)= 13.615,p= .001, R2= .171). I mix up letters when writing (F (1,66)= 19.668,p= .001, R2= .230). I mix up words when writing (F (1,66)= 24.032, p=.001, R2= .267). These four items yield similar results when analysed in relation with pseudoword reading time. I mix up letters when reading (F (1,66)= 10.678, p=.002, R2= .139). I mix up words when reading (F (1,66)= 8.442,p=.005, R2= .113). I mix up letters when writing (F (1,66)= 6.749,p= .012, R2= .093). I mix up words when writing (F (1,66)= 12.362, p=. 001, R2= .158). Students who reported I make spelling mistakes got lower scores on an orthographic decision task (F (1,62)= 8.137, p = .006, R2= .118). The objective nature of spelling could have contributed to get accurate judgements. On the contrary, only the item I frequently need to go back to the text to check my understanding (F (1,66)= 3.949, p= .0051, R2= .057) predicted the performance on its corresponding reading comprehension task, in this case number of errors. A plausible explanation could be the lack of objective criteria to self-evaluate comprehension performance. However, the prediction failure could also be due to the test used to measure reading comprehension. Although it is well constructed and it could obtain accurate measures of the reader's ability to make inferences, it is not a good test to evaluate the low processes affected in dyslexic readers. A test of reading efficiency would have been a more appropriate measure. Another result of interest is the relation between responses to the items of oral abilities and the results on naming and fluency. Declaring that Sometimes I make mispronunciations or use the wrong word was related to the number of right answers (F (1,66)= 3.280, p= .075, R2= .047), to the time taken to complete the Rapid Automatic Naming task (F (1,66)= 20.291, p=. 001, R2= .235), and to the score obtained on the task of fluency (F (1,66)= 9.874, p=.003, R2= .129). The statement (I find it difficult to) find the right word was related to the time to complete the Rapid Automatic Naming task F (1,66)= 29.432, p = .001, R2= .308), and verbal fluency performance (F (1,66)= 8.428, p= .005, R2= .129). Finally, (I find it difficult to) find the right word is related to the number of words used for the précis (F (1,66)= 4.292, p =.043, R2= .072). Following the coherence and high correlations obtained in the results, it could be assumed that ATLAS could gather valid information highly close to measures obtained by specific tests. The aim of this study was to design and explore the validity and reliability of a self-report questionnaire to gather information about reading abilities in adults. This aim required first selecting critical items, second testing whether items were able to discriminate between normal and poor readers, and it they predicted outcome on psychometric tests. In Study 1, participants were presented with a set of items to describe their reading abilities. The results showed participants were careful choosing statements to describe themselves. Proof of this is that the most specific characteristic of dyslexic readers (i.e. I mix up letters when reading) were chosen by few students, mostly those who reported having past or current reading difficulties. These results fitted in well with Schulte-Körne et al. 's (1997) or Wolff & Lundberg's (2003) argument that self-reports are highly discriminative. In Study 2, a complete version of the self-report questionnaire was administered along with a battery of psychometric tests. Altogether the results of this study found three main findings. First, they supported the notion that adults have an accurate perception of their abilities, and are able to make realistic descriptions. Second, participants' reports did not differ from data obtained by specific tests. Although the coincidence did not reach the 80% reported by other studies, the most representative characteristics of poor readers, i.e. words and pseudowords scrambling, were highly predicted by the items in the questionnaire. Third, items discriminated between good and poor readers. Considering the whole set of results it could be assumed that ATLAS gathers similar information to psychometric tests. Before concluding it is worth addressing some limitations that could affect the generalizability of results. One is the limited number or dyslexic participants. The other is the high educational level of the participants. As Ramus et al. (2003) argued, university students are privileged respondents, clearly aware of their difficulties, whose reports could be more accurate than the average. Nevertheless, the present results agree with previous findings (Deacon et al., 2012; Hatcher et al., 2002; Schulte-Körne et al., 1997; Snowling et. al., 2012, among others). These limitations should be taken to use ATLAS with caution, without disregarding its evident advantages. As expected, adults have shown to be able to provide accurate self-reports of their abilities if presented with the right questions. It is then important to count on sensitive procedures for the assessment of adults. Used for screening purposes or to recruit research participants, ATLAS could gather a wide range of information in a short time. It could also serve as the starting point to consider individual advising or intervention (Callens et al, 2012). We are sincerely thankful to the anonymous reviewers for their suggestions that no doubt have contributed to a better version of the paper.